Over the course of an illustrious fifty-year career as a journalist, Jeremy Thompson has been in the thick of it. An award-winning broadcaster, he worked for the BBC, ITN and as anchor of Sky News’ early evening programme, reporting on monumental events around the world: from Indira Gandhi’s assassination and the Tiananmen Square massacre to the release of Nelson Mandela – and everything in between. In his sometimes poignant, sometimes hilarious, and always entertaining memoir, Thompson reveals the devastating human costs of war, interspersing this with comic interludes, including the time he persuaded Sierra Leone’s President to sweep the streets. The first person to broadcast live as British peacekeepers entered Kosovo, Thompson also covered the Gulf Wars. From his early days covering rows over pet budgies for a local newspaper to reporting on the election of President Trump for Sky News, Thompson has seen it all. Jeremy Thompson is one of the great television reporters of his generation. He knows the story, knows how to tell it and knows his audience – as this book shows. A bold and gripping trip through the last four decades of the world's biggest news stories – and some lovely peeks behind the scenes – from the man who defined Breaking News in Britain. Breaking News is so much more than a great memoir. It is history in the making, a masterclass in journalism, and sheer reading pleasure. Not only is Jeremy Thompson a wonderful friend, he is also an outstanding journalist. Jeremy possesses the courage, sensitivity, dedication and tenacity that is needed to make a great reporter and Breaking News is a fascinating account of his life in news. 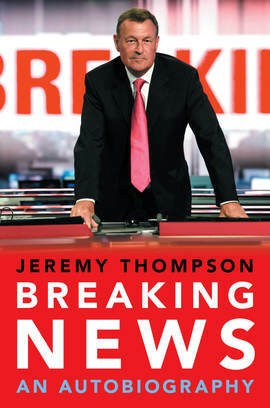 Jeremy Thompson’s Breaking News is a wonderfully told story about the very soul of journalism; about how news gets reported; about the sacrifices serious journalism demands; about paying dues; and about what journalism is supposed to be. It’s no wonder that whenever Jeremy’s name is mentioned, the word gravitas immediately springs to mind.